As a law school that strives to embody excellence in legal education, the LSU Law Center seeks to create a vibrant, stimulating, diverse, and challenging educational environment. From its founding in 1906, the LSU Law Center has offered its students a legal education recognized for its high standards of academic excellence and an outstanding teaching and research faculty. 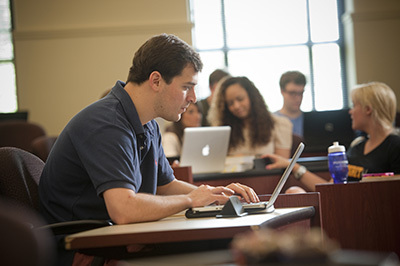 Students are trained rigorously in the same common law and federal law subjects that are taught at other leading American law schools, leading to the award of the Juris Doctor. The curriculum also reflects the Law Center’s role as a curator of the civil law. While the Law Center has historically offered an integrated program in Anglo–American common law and Louisiana civil law, recent changes to the curriculum now allow students to decide whether to pursue advanced study of the civil law. Students pursuing the Juris Doctor may now elect to pursue the Graduate Diploma in Comparative Law by taking courses that offer an extensive comparison of the law under the two legal systems. The Graduate Certificate in Energy Law and Policy (the “Energy Certificate”) allows the Law Center to recognize students who have demonstrated substantial competence in the study of energy law and related subject matter. The curriculum is interdisciplinary in nature and designed to prepare lawyers for the full range of 21st century practice and leadership in the complex world of energy law. The LSU John P. Laborde Energy Law Center, established in 2012, is the first such center in Louisiana, and one of a handful in law schools nationwide. The center and curriculum take advantage of the uniquely comprehensive “energy laboratory” provided by Louisiana. The coursework includes both foundational energy law courses and elective courses, as well as research and writing, applied learning experiences, and service with the Law Energy Law Center. In addition, numerous dual degree programs take advantage of the strengths and academic rigor of LSU, a major research university. Dual programs are available with the LSU E.J. Ourso College of Business, Manship School of Mass Communication and LSU School of Social Work. Students may earn the J.D.-Masters of Business Administration, J.D.-Masters of Public Administration, J.D.-Masters in Finance, J.D.-Masters of Mass Communication or the J.D.- Master of Social Work. A strong program of legal writing and research prepares LSU Law students for the rigors of law school and for practice. Third-year students participate in a three-day annual Trial Advocacy program, taught by some of the nation’s leading experts in courtroom practices. From cross-examination to voir dire jury selection, students get to role play, receive critiques, and hone their advocacy skills under the direction of a talented faculty. The Law Center’s Advocacy Programs are among the largest law student advocacy skills training programs in the United States. With over 150 student participants annually participating in six different LSU-hosted internal advocacy competitions, over twenty-five traveling advocacy competition teams, a series of skills workshops and boot camps, and related simulation courses, the LSU Law Center Advocacy Programs provide students with an exceptional array of opportunities to develop their skills as persuasive advocates. Apprenticeship Week, a new practical skills program, is offered free to second and third-year law students. The program is a week-long series of mini-courses, taught by master lawyers and judges. Students choose from among a wide array of topics that vary each year, ranging from Preparing an Expert Witness to The Law of Drones. Classes feature small enrollment and focus on practical, hands-on topics. Each mini-course provides students with focused, task-oriented training not generally available in law school courses and usually available only through actual practice experience. Many experiential opportunities are afforded to students. There’s no better place than Baton Rouge, the seat of state government, when seeking a state or local governmental agency position. Students experience the real practice of law in a structured academic setting, all while earning course credit. Additional Field placement opportunities are available, including those through the Judicial Field placement Program that places students as judicial ‘law clerks’ in state and federal courts, along with public interest and nonprofit organizations. Through the LSU Law Clinic, the Law Center offers second and third-year students the opportunity to practice law and represent indigent clients in the Baton Rouge community. A variety of clinics are taught by experienced faculty. LSU law faculty are known for going the extra mile, inside and outside the classroom, to assure their students of a demanding, yet personal, legal education. Faculty scholarship combines quality with an impressive quantity of professional books, articles, volume supplements, and casebooks. Faculty hold expertise on legal matters of international, national, and state-level importance and are eager to engage students in discussions, both in and of class. An impressive list of courses is offered on an annual basis by both full-time faculty and talented adjunct faculty members. Adjunct faculty members include practicing judges and lawyers who are renowned within their field of expertise.